Plans for a major increase in capacity at the Centre for Clinical Haematology (CCH) at the Queen Elizabeth Hospital in Selly Oak has been unveiled. As a result of a 400 per cent growth in patient referrals since it opened in 2006, the CCH has outgrown its capacity. In order drive forward access to innovative therapies, the patient footprint will be doubled at the centre at a cost of £1.5 million. The money will pay for more research nurses, capacity to deliver more clinical trials, potential to deliver stem cell transplant to outpatients, novel new treatments and drugs and dramatically improved patient experience. Geoff Thomas, the former Wolves and Crystal Palace footballer and patron of Cure Leukaemia, has pledged to raise £1 million of the overall total via a gruelling charity cycling event next July called Le Tour - One Day Ahead. The challenge involves cycling the Tour de France route before the real event, covering more than 3,300 km over three weeks. Mr Thomas was diagnosed with chronic myeloid leukaemia in 2003 and despite, being given less than three months to live, has been in remission since 2005 following treatment from Charlie Craddock, professor of haemotology at the Queen Elizabeth Hospital. The news was announced at a special parliamentary reception hosted by John Baron MP, chairman of the All Party Parliamentary Group on Cancer. Speaking in Westminster, Mr Thomas said: "I owe my life to the excellence of the haematology team at the Queen Elizabeth Hospital and I have always been honoured to be a patron of this great charity. "When I heard about the opportunity to increase the amount of work carried out by the centre where I was treated......I was determined to do something to make a significant difference." 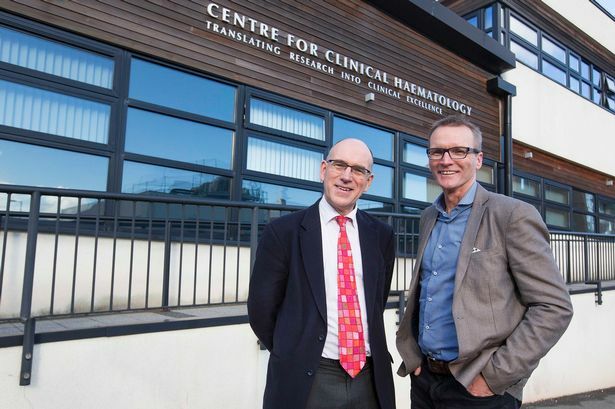 Professor Craddock added: "Geoff has been an inspiration to both patients and clinicians ever since his transplant ten years ago through his selfless work to increase treatment options for blood cancer patients. "It is a huge privilege to be working with him again to raise funds for the centre which will increase curative options for patients across the UK."